An outstanding foliage plant, Asplenium australasicum ‘Lasagna’ with its glossy deep green foliage can be grown as an indoor plant or in a protected position in the garden. 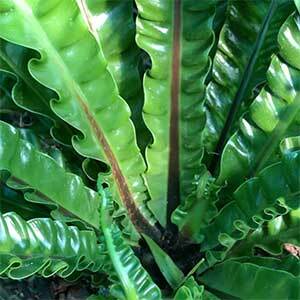 The fronds will reach around 1.5 metres in length and the plant itself form a neat rosette. With wavy leaf margins, this makes a great feature plant and will grow equally well in containers, in the garden itself of in the fork of, or attached to a tree. Being an epiphytic plant, if you are growing Asplenium ‘Lasagna’ in the ground, we suggest that you hill up, the soil a little to ensure that drainage is excellent. Once planted this is a remarkably low maintenance plant. A little liquid fertiliser in spring and early summer should be sufficient. A position in shade, yet with good filtered light is recommended. Do not over water as this can cause root problems. Prune away old dead foliage as required. Common Name – Asplenium ‘Lasagna’, Asplenium Bush Baby. Foliage – Deep green wavy leaf margins.